Guest blogger Chielozona Eze is associate professor of English and postcolonial studies at Northeastern Illinois University, Chicago. He also runs a blog focused on African literture, African Literature News and Review. Afam Akeh is one of the better known names among his generation of Nigerian poets. He is not known for many volumes. In fact, his literary fame rests solely on his only collection of poems to date, Stolen Moments, published in 1988. Based on the mastery displayed in it though, the African poetry community eagerly anticipated his next volume. Letter Home & Biafran Nights is worth the long wait. Like the smell of mango freshly plucked from tree, the first stanza caresses your sense with its rich lyrical and philosophical sweep. This is easily one of the most remarkable beginning stanzas of the poems I’ve read in the recent past. Exposing a contrast between an individual and the universe that is symbolized by dream, the first stanza announces the overarching theme of the collection. One imagines the lone traveller’s paws against the infinite magnitude of the world that does not really care. It is against this backdrop that this pilgrim, who might have seen himself as a prodigal son, suddenly sheds his guilt. The instinct for survival in a foreign environment takes over the rein of his life. This is, indeed, what most of the poems in this collection are about. A heart torn between loyalty to the land of his birth and the land he has taken refuge in, between personal survival and duty to the larger world. The first poem, “Letter Home,” is divided into four sections that relate the narratives of four African exiles in the West. Their heartbreaking fates are linked to their home by the trail of the letter. Another of the poems, “Letter to Soyinka,” is a retort to what might have been perceived as Soyinka’s failure to understand why many children of Africa have fled the continent. It is biting in its direct, too direct, address to the Nobel laureate. has your name on it? But the anger of these lines is a mere expression of the speaker’s frustrations at not being in the land he loves and at being misunderstood by none other than Wole Soyinka, one of the best minds his country has produced. The speaker’s generation has been excreted from the land by the failures of the Nobel laureate’s generation. “Biafran Nights” is, thankfully, long and in three parts. I wish it were even longer. Each stanza is a cache of precious imagery, allusions, metaphors that leave no doubt that a master is at work. The whole poem is as soulful as the prayer of a truly humble believer in the infinity of the universe and the smallness of man; it is to be savored. See, for instance, how the second part begins: “Not a litany of events, history is human smells/and sounds, private motives in public spaces.” There could be no better wisdom than this, no better note of caution. Indeed, poetry, as the manifesto spells out, shakes hands with normal folk. Akeh is best as a philosophizing lyricist, who tends to make extensive, wisdom-packed statements. It is perhaps in respect to the depth and richness of the wisdom of these words that he chose to be as lucid as the biblical prophets. Every once in a while one wished he had balanced the lyricism with more narrative and imagistic details. More descriptions. This is, however, merely a philosophical question that does not detract from the beauty of the collection. 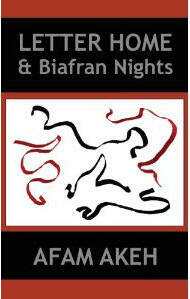 Letter Home & Biafran Nights is a literary success. Afam Akeh should’t have dabbled into Soyinka who is not fellow Poet friendly. He reads meanings into everything. I doubt if fans of Chinua Achebe can easily forgive Soyinka for degrading Achebe after he died. @Pa Ikhide, the link to the web page of your guess blogger is no longer available. What’s up? Peace! Website not web page! Sho! Web page makes it look like a link to a previous blog post on your website.